I’d like to invite you to consider joining the Passion of Italy Festival I am leading in summer 2014. The festival will bring together fine singers from around the U.S. to perform in Rome, a city steeped in ancient history, and home to such sights as the Colosseum, one of the architectural wonders of the world. We invite full ensembles or groups of singers (and their friends) to join us. 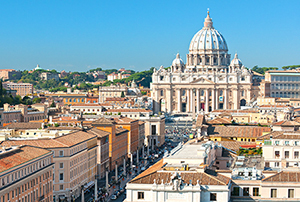 In addition to singing for mass at St. Peter’s Basilica and a combined gala concert, choirs will also have the opportunity to give individual concerts, and even to expand their tour to such cities as Florence or Venice. I will craft a program that is especially suited to the American choirs that will form the festival choir, and acoustically tailored to the glorious spaces in which we will perform. I know this will be a joyous celebration of the power of singing together, and I invite you to be in contact with KIconcerts for more information. I hope to have the opportunity to explore glorious Rome together with you!